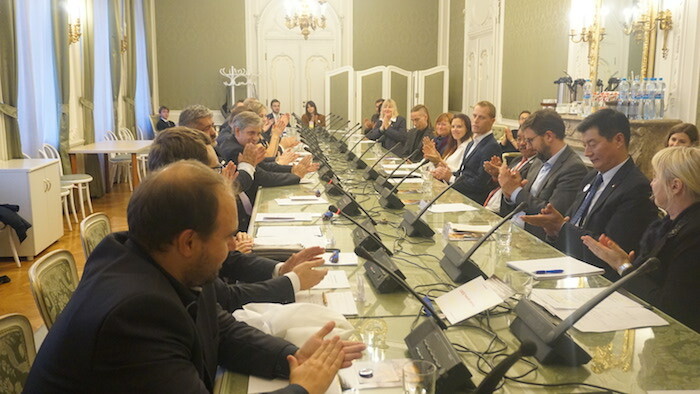 (TibetanReview.net, Oct11, 2018) – A cross-party Tibet group established in the parliament of the Czech Republic in September was formally inaugurated on Oct 9. It is the largest Tibet support group in Europe. The launch of the group was made on the occasion of the holding of this year’s Forum 2000 conference. President Lobsang Sangay of the Central Tibetan Administration (CTA), who was taking part in the conference, spoke at the event. The launch event was held in the Senate hall. The group’s launch was initiated by Dana Balcarová and František Kopřiva from the Pirate Party, Marek Benda from the Civic Democrat (ODS), and independent senator Jitka Seitlová. The group – called ‘Friends of Tibet’, according to radio.cz/en, Oct 10 – has more than 50 representatives from the two Chambers of the Czech Parliament – the Chamber of Deputies and the Senate. CTA said in a Tibet.net statement Oct 10 that the group, which it described as ‘Czech Parliamentary Group for Tibet’, was the largest in the Czech Parliament as well as the largest parliamentary group for Tibet Europe. The group plans to organise seminars and exhibitions related to Tibetan issues, receive visits by the Tibetan government-in-exile and react publicly to any news concerning Tibet. Mikuláš Peksa has clarified that the activities will focus mainly on human rights issues as well as environmental and cyber protection. The All Party Parliamentary Tibet Support Group of the Japanese Parliament with 90 MPs, including 49 from the ruling Liberal Democratic Party, is the world’s largest, according to a Tibet.net statement Feb 20.